One of the biggest movies of the year has given birth to one of the biggest trading card products of the year. 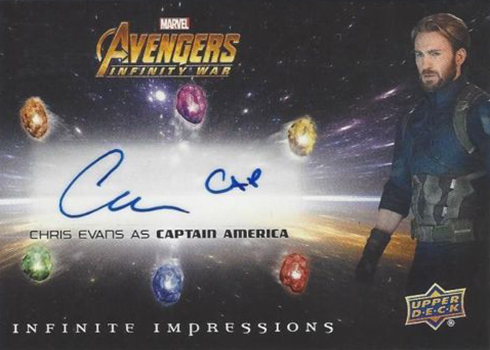 Upper Deck’s 2018 Avengers: Infinity War went live on October 3rd, creating a huge buzz with its autograph signers. 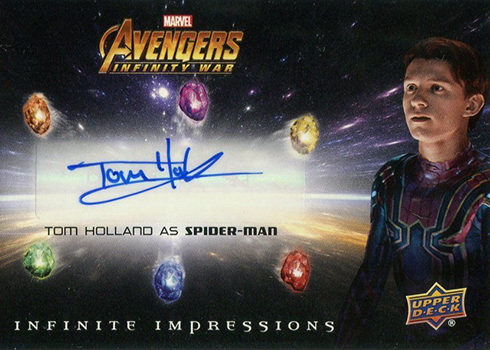 While many of the Upper Deck MCU products have been hit-or-miss in terms of autographs, Infinity War is an arc reactor full of awesome. There are four different autograph sets to chase: Infinite Impressions Autographs, Infinite Impressions Inscriptions, Infinite Impressions Dual Autographs, and Film Cel Autographs. The trio of Brolin, Holland, and Olsen are the prominent first-time signers while Evans, Hemsworth, Gillian, Bautista, and Klementieff are the returning veterans. Wong and Vaughan-Lawlor round out the rest and they, too, are first-time signers. Through Friday, October 12, there were 71 confirmed sales on eBay. 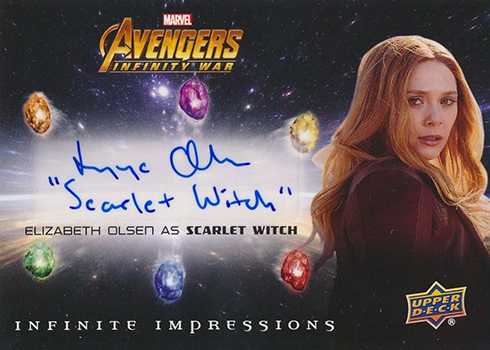 Elizabeth Olsen leads the way with 22 autographs sold. Her regular autographs are selling in the $300-$750 range, while her inscriptions are going for a bit higher at $500-$1,100. Her lone Film Cel autograph sold for $600.